Are you looking for a happy place? My friend, we have just the spot for you. It’s called a skydiving dropzone, and it’s a place where a remarkably diverse community is united under the banner of freedom. Better yet: That community is stoked to welcome you with open arms. If you don’t already know that skydiving is not only a serious sport but a popular hobby, it might surprise you to know that this is a community of wide-open minds. We have a notion why. We believe that freefall erases the philosophical differences between us. We believe it dissolves discrimination using the same pathways it uses to dissolves insecurity and stress. We usually don’t think too much about it. For us, unity is normal. It’s just the way it is in the sky. At the same time as skydiving doesn’t choose sides, creeds or colors, skydiving doesn’t discriminate against you for coming exactly as you are. You’re welcome on the dropzone! 1. Skydiving doesn’t discriminate against any religion. Skydivers don’t mind where you go to church. They won’t notice if you’re thumbing through a Bible, a Quran, a leather tome of pagan spells or nothing at all. As long as there’s a skydiving logbook in your backpack, you’re good to go. We should be clear on one point, however: Skydivers are believers. Passionate believers. Believers that this incredible sport represents the very best way to model a diverse group working together towards goals in a high-pressure environment. And we’re sure that all our individual gods are on board with that. 2. Skydiving doesn’t discriminate against any skin colors. …because honestly, what does that have to do with anything? The only time I’ve ever seen anyone comment on skin color at a dropzone has been when someone got a bruise, and it was to ask if they could go on an ice run to improve the situation. 3. Skydiving doesn’t truck with gender lines. Skydivers are pretty reliably unlikely to have any opinion whatsoever about your choices in romantic partners (unless they’re working up the courage to ask you out). To be clear: We’ve seen the inside walls of plenty of dropzone bathrooms, and we’ve never seen anything resembling a homophobic slur. To us, wasting energy on homophobia is as useless as wasting energy on any other phobia. Who has time for that? We’re busy on the dropzone doing things that matter: for instance, rolling around on our bellies on modified furniture dollies and hanging off of the mockup like monkeys before we practice our next skydive by chasing each other around a grass field. For any given skydiver, here’s what it comes down to: If you insist on discriminating against your fellow humans, you’re bound to have fewer friends to jump with. And who wants that? Certainly not us. Just as skydiving has the power to make you better as a person, it has the power to make a group of people better for each other and the world. 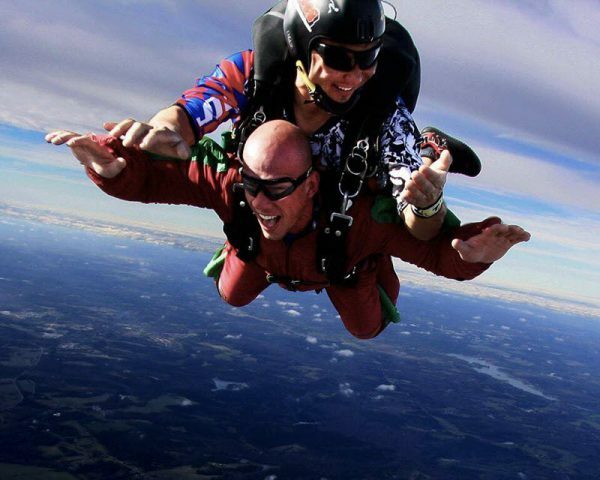 It only takes a glance at skydiving-fueled charity projects–for low-income breast cancer victims; for veterans; for animals; for disaster victims–to see how skydivers come together to better the world. Whaddaya say? Are you ready to join us up here in the most inclusive community you’re ever gonna find? We’re looking forward to meeting you!